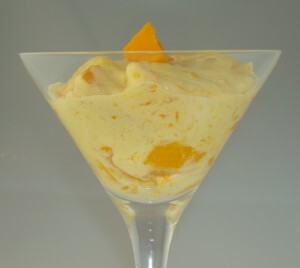 Heavenly Alphonso mangoes with cream and cointreau. 1. Lightly whip the cream, cointreau and sugar together – just until the cream thickens a little bit – the cream should not be stiff. 2. Skin, and then cut the mangoes into bite sized pieces and add to the cream. 3. Chill in a fridge for at least a couple of hours before serving – leaving the mangoes and cointreau to infuse into the cream lets their flavours permeate through to produce a divine dessert! This is my Indian adaptation of Strawberries Romanoff! For those of you who don’t know what an Alphonso mango is, they hail from India and are the Rolls Royce of mangoes! This voluptuous, ambrosial Indian fruit can’t be beaten for flavour or sweetness – they are also one of the last bastions of seasonally available fruits, being around only from April to June. I can’t decide whether I want some hot Southern hemisphere country to start growing them or not….on the one hand they are heavenly and I love them and it would be amazing to be able to eat them in winter… but would they still feel as special if they were to be had all year round? Tough one! I remember when strawberries used to be in the supermarkets only in summer; they did seem more precious then. The Indian kesar mangoes are a pretty good runner up to the Alphonso, and very conveniently come into season just as the Alphonsos are on their way out. (By the way the Pakistani mangoes aren’t a patch on the Indian Alphonso Mangoes….even the Pakistanis would have to admit defeat on the mango front! ).